Anaheim/Orange County Walk of Stars. FIRST STAR--NOV. 10, 2006: Walt Disney, Movie Producer, creator of Mickey Mouse and Founder of Disneyland..
DECEMBER 2006: Carl Karcher who owns Carls Jr. Fast Food Chain. MARCH 2007: Henry & Susan Samueli owns the Anaheim Ducks Hockey Team (NHL). Under their leadership, The Ducks won the Stanley Cup in 2007. WINTER 2008: The Yorba Family and The Taormina Family. Early Settlers of Orange County. SPRING 2008: Gene Autry. Brought Professional Sports to Orange County. MAY 2008: Monsignor John Sammon. Acted as Chaplain of the Los Angeles Rams, plus firefighters, law enforcement, and many organizations in Orange County. AUG. 2008: Bruno Serato. Owner of The White House Restaurant. OCT. 2008: The Righteous Brothers. Bill Medley and Bobby Hatfield Performed many hit songs in the 1960's, including "Unchained Melody." FEB. 2009. Donna and John Crean. MAY 2009: Sammy Lee, M.D. Olympic Gold Medalist who competed in 1948 and 1952. HOME. | The "Orange County" Moniker. | About Anaheim and Orange County | Award Winning Speech. 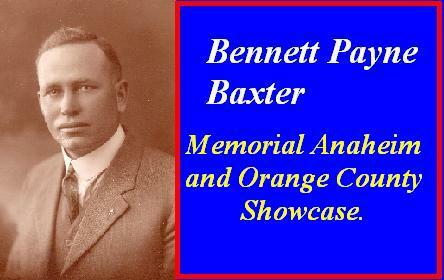 | Bennett Payne Baxter--Anaheim Pioneer. | Baxter Family Reunion 2010. | Anaheim Airport | Anaheim/Orange County Walk of Stars. | Nominate Mr. Autry. | Why Gene Autry Should be in Cooperstown. | Disney vs, Anaheim? Say it Ain't So! | Orange County Flyers Player of the Year. | Angels vs. Anaheim Era.